Maddy’s big sisters have warned her about going to Grandmère’s home deep in the Louisiana bayou. It’s boring, they say; there’s no TV, no mall, no microwave, not even indoor plumbing. Not only that, Grandmère’s a witch. Maddy has a mind of her own, though, and anticipates an adventure far from the glass and concrete world of New Orleans. The magic begins on the car ride to the bayou. When a firefly perches on the rim of the car door, Maddy’s imagination is fired; surely it’s some kind of signal. Under Grandmère’s guidance, she will, over the course of the summer, discover her own power, her place in a long line of Lavaliers, and an enchanted land replete with helpful fireflies and mermaids. Grandmère doesn’t look like much of a sage. She’s tiny, “bird-boned,” with “bright-white curly hair, luminous like the moon.” She calls herself the drugstore because of her knowledge of beneficial herbs and plants. Maddy and Grandmère settle into a cozy routine of humming together, collecting eggs from the hen, doing dishes, and sitting on the porch. As the days pass, Grandmère tells ten-year-old Maddy stories about her ancestors and teaches her important principles such as respect yourself, pay attention, and leave space for imagination. Each of these will enable the girl to come to a new appreciation of herself, her heritage, and the bayou’s fragile environment. Perhaps best of all, she meets a wiry, energetic boy called Bear, and the two form a striking bond as they run around, get dirty, and explore the bayou together. Her adventure, or at least her imagination, takes off the day she sees a mermaid rise from the dark waters. At first, Maddy reveals her secret to no one but Grandmère, who believes the girl has encountered the legendary Mami Wata, who followed imprisoned Africans forced to cross to North America in the dank holds of slave ships. 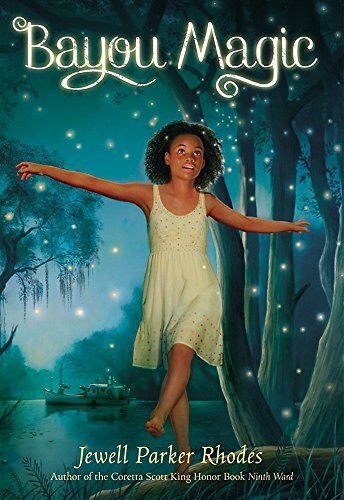 Later, as an environmental disaster endangers the Bayou Bon Temps, Maddy calls upon her own powers, as well as help from fireflies and mermaids, to rescue the community she cherishes. Middle-school girls with a fanciful flair will snap up this novel imbued with magical mystery and a young girl’s hopeful imagination.